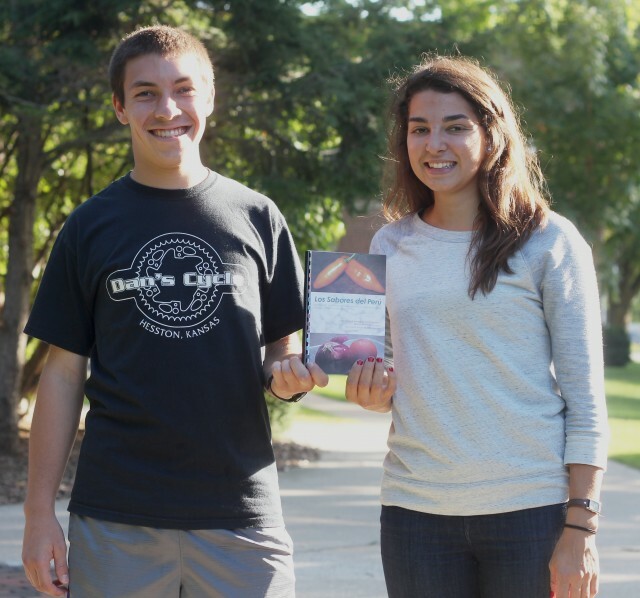 This summer, two students created a Peruvian cookbook, “Los Sabores del Peru,” to sell for charity. Gretchen Geyer, a senior studying social work and business, went to Peru for Study Service Term (SST) in the spring of 2014. During the Service portion of her time, she lived in Ayacucho, where she worked to prepare food at the comedor, a free soup kitchen hosted by the church Luz Y Vida. There, she and two other chefs worked, “essentially making food for 50 to 60 little children from the ages of 3 to 14,” said Geyer. For Geyer’s final project, she studied differences between food preparation in Peru and the United States. Geyer collected recipes from the comedor and her host families. She observed food preparation, too. “I spent seven hours one day with my host grandmother making food together and got lots of recipes from her during that time,” Geyer said. In the cookbook Geyer provides authentic Peruvian recipes with modifications for local chefs. Sometimes ingredients aren’t readily available in the U.S.
“That’s what happens when you make food outside of the country,” Geyer said. Peru, for instance, is home to thousands of potato varieties, yet the U.S. only has a handful of common kinds. In recipes that call for specific potato types, Geyer notes alternatives. She believes that final products will still taste delicious and that most people won’t be able to taste the difference. After presenting the final project to her SST group, many of Geyer’s classmates asked for copies of the recipes. Jake Smucker, a senior studying multimedia communications and graphic design, volunteered to edit it into a book. Geyer and Smucker worked for hours over the summer to perfect their cookbook. Through the extensive process, Smucker is proud of the quality work they’ve invested. He’s excited to see consumer reactions, too. “Now that the end is in sight, we really just want to get people their cookbooks and smell Peruvian food cooking all over campus,” Smucker said. Despite their hard work, Geyer and Smucker won’t be reaping a profit. The $10 cookbooks will cost $4.50 to print. Remaining profit will go to the comedor, where Geyer worked. All supplies used to feed the 60 children daily are provided by donations. One meal for the full group costs around $25 U.S. dollars. Geyer knows how important the church’s services are for the children. “These were kids who otherwise would not have had maybe anything to eat,” Geyer said. Mothers, unable to provide sufficient food for their families send their children down a large hill to receive lunch at the comedor. Geyer hopes funds from the cookbook will make a difference. “I would really like to see us be able to provide enough food fora month,” she said. So far, Smucker and Geyer have received 80 orders for cookbooks, and hope to sell more. “It feels great to be personally supported, but I also realize that they’re ultimately supporting this community that has such a place in my heart,” Geyer said. Though Geyer enjoys cooking, she values the relationships built by cooking together even more. Initially concerned she wouldn’t remember SST experiences after leaving Peru, Geyer found that the book enabled her to continue processing her experience.